As I nosing around the internet yesterday, I came across some strange pots and pans that I had never seen before. Thought they would be fun for you to see too. I have included the “commercial” information for each piece so you can get an idea of the designer’s original purpose. Easy as 1, 2, 3. 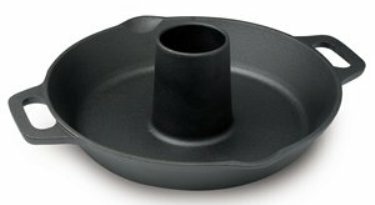 The three individual cooking areas of this fry pan allow you to prepare different meal components all in one dish. 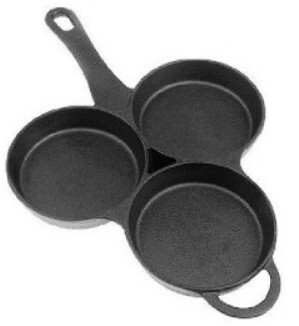 The cast iron design conducts heat evenly, retains it longer than other materials, and can be used on a stovetop, in the oven, on the grill, even over a campfire. The pan is great for families with a picky eater, or in a household where allergies make cross-contamination a concern. Make three kinds of lasagna in the same pan – inventive design is great for families, dinner parties and more. Durable aluminized-steel construction provides quick, even heat; nonstick finish for easy release and cleanup. Measures approximately 12″ x 15″ x 3″. This vertical poultry roaster is the ultimate in the one dish meal concept. The center volcano-well has been designed to contain herbs and seasonings for infusing flavor as it roasts. The wide, ergonomically designed handles ensure secure handling in and out of the oven or grill. Cook up flavorful, moist bird with a cripy skin every time and avoid over cooking with the center cone design. Heats from the inside and out while infusing with flavors and moisture. The deep base is designed to contain root vegetables and smaller proteins. A convenient pour spout makes for easy transfer of vegetables and easy clean up. Vegetables in the base of the pan can baste in the natural juices of the poultry for moist and flavorful side dishes. Lasts a lifetime, often becoming a family heirloom to be passed through the generations. Chef Emeril created recipes are included. Spice up your cookware collection with this 3-qt garlic pot. Durably constructed of cast iron with a white enamel surface, it’s shaped like a real clove of garlic to add a fun and functional touch to any kitchen. Pair it with the matching garlic-shaped trivet and serve with style. A pot for all seasons – and seasonings. 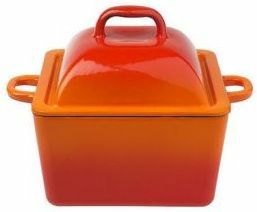 Whatever you’re cooking, this square pot’s cast iron construction retains heat for maximum cooking performance. 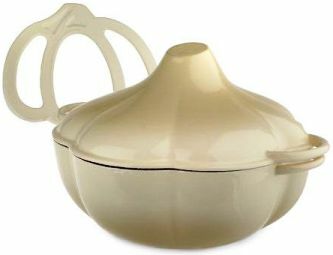 The enamel porcelain exterior and cream-colored interior transitions easily from oven to table, making a delightful presentation. Includes 3.5 qt square pot and dome lid. With lid, measures approximately 8″L x 8″W x 8-1/2″H. Stir up something succulent in this Technique(R) enameled pot. Made of cast iron for exceptional heat retention, the pot has a 3.5 qt capacity that offers plenty of room for browning, braising, reducing, and caramelizing. Take the square-shaped pot from oven to table, as it provides the perfect presentation and keeps food warm for extended periods of time. 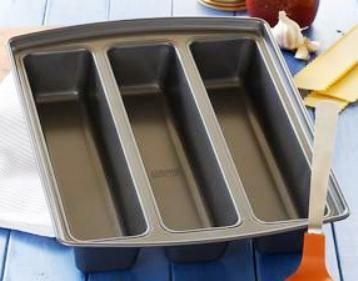 Plus, the versatile lid of this pot can be used alone as a baking pan. meal, they left the restaurant and resumed their trip. 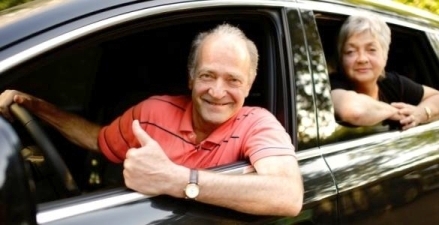 they had been driving for about forty minutes. scolded his wife relentlessly during the entire return drive. He just wouldn’t let up for a single minute. *Another great one from Bill. Are you happy that Grandma is coming to visit? Then clap your hands, stamp your feet and shout hurray! P. S. Only 9 more days until my airplane arrives! • Because you shouldn’t have to look at your blog like it’s a treadmill. • Because it’s okay to just say what you have to say. If that makes for a long post, fine. Short post, fine. Frequent post, fine. Infrequent post, fine. • Because it’s okay to not always be enthralled with the sound of your own typing. • Because sometimes less is more. • Because only blogging when you feel truly inspired keeps up the integrity of your blog. • Because they are probably not going to inscribe your stat, link and comment numbers on your tombstone. • Because if you blog without obligation you’ll naturally keep your blog around longer, because it won’t be a chore. One post at a time . . . no apologies! *~ Hats off to Tartx. ! ! YES, THAT’S TODAY ! ! 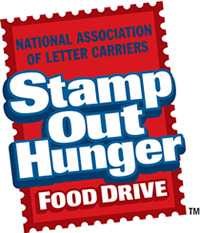 The 18th annual NALC National Food Drive to “Stamp Out Hunger” is the largest one-day food drive in the nation. Carriers collected a record 73.4 million pounds of food in last year’s drive. The drive is held annually in over 10,000 cities and towns in all 50 states, the District of Columbia, Puerto Rico and Guam. Donations from this year’s drive are expected to push the overall total since the annual drive began 18 years ago to over 1 billion pounds. The total currently is 982.7 million pounds. Donations will be collected by more than 1,400 local branches of the 295,000-member postal union and delivered to food banks, pantries and shelters that serve the communities where they are collected. Assisting in the effort are rural letter carriers and other postal employees, as well as members of other unions and thousands of civic volunteers. NALC President Fredric V. Rolando emphasized that as successful as the food drive has been in the past, it simply must be even better this year. “Millions and millions of families are suffering – struggling to make ends meet and put food on the table,” Rolando said. “Food banks, pantries and shelters need our help more than ever this year. As families count on them for support, they’re counting on us and we will not back off on our commitment.” Rolando also noted that donations are particularly critical at this time since most school lunch programs are suspended during the summer months and millions of children must find alternate sources of nutrition. More than 126 million postcards, sponsored by the U.S. 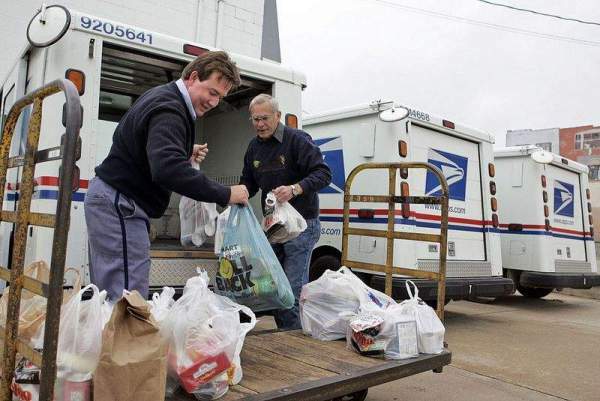 Postal Service and Campbell Soup Company, were delivered to postal branches to remind residents to leave food out by their mailboxes on May 8, that’s today. These followed more than 40 million special Valpak envelopes that were delivered in April and May also promoting donations. Did you spring into action? 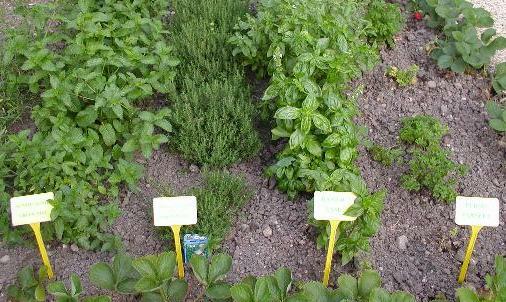 Today I was planning to do a write up on using fresh herbs, as opposed to dry herbs, when cooking. Then I chanced over to Our Best Bites and found this wonderful tutorial, full of more information than I could ever have imparted. Lotza gems, like this one! or use 3 times fresh that you would dried. 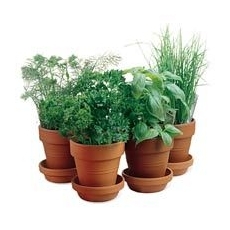 Helpful herb guides for growing a successful crop, include: What to grow. Where to plant. Soil needs. Using the herbs. Cutting herbs. Cooking with herbs. Preserving herbs. And super recipes using your herb bounty. you would also enjoy this great post. Cell phone numbers are being released to telemarketing companies and money is being made at your expense. Think about how many sales calls you receive in a week. I personally never answer any number that I do not recognize or that does not come up on my caller ID. Sometimes a number slips through the cracks and you are caught with an unwanted solicitation. I hang up and immediately “tag” the unwanted number and put it on my fraud list in my address book. CELL PHONE NUMBERS ARE COLLECTED, COMPILED AND SOLD! SOME PEOPLE ARE ACTUALLY BEING CHARGED FOR THESE CALLS. READ YOUR MONTHLY BILL/S CAREFULLY! This is the National DO NOT CALL list. It will only take a minute of your time. However, you must call from the cell phone number you want to have blocked. You cannot call from a different phone number. It takes about 20 seconds. You type 1 for English. Many of us change cell phone carriers and/or phone numbers every few years, so it is always good to re-do this procedure. Also these days many people actually use their cell phone as their main telephone number. Now when you purchase something at the store and the clerk at the check-out asks for your telephone number, many of us give our cell number to them. That information is then used by the store and quite possibly sold to telemarketers. FORWARD TO ALL YOUR FAMILY AND FRIENDS. DON’T GET CAUGHT IN THIS VICIOUS CYCLE!